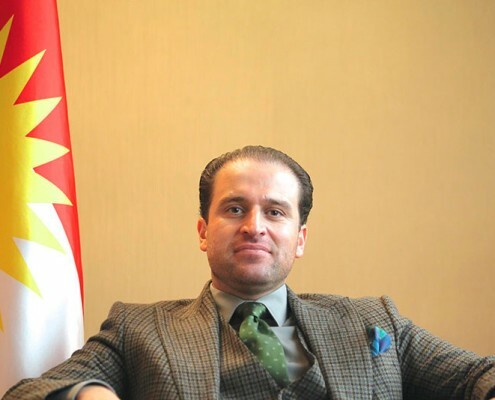 Mr Daban Shadala is the Kurdistan Regional Governments Representative in Spain. He was assigned to this post during the 6th KRG cabinet which was led by ex-Prime Minister, Barham Salih. Prior to his post in Madrid, Mr Shadala was representing his political party, the Patriotic Union of Kurdistan in Vienna, Austria. During his PUK stint in Vienna Mr Shadala organised many training courses in Austria for Kurdish doctors, engineers, university professors, as well as providing opportunities for Kurdish academics to conduct research in Austrian universities. He also led many political and business delegations to and from the Kurdistan Region in order to explore potential areas of collaboration and to improve the relations between Austria and the Kurdistan Region. Health treatment for Kurdish children and youth development are two areas that Mr. Shadala is particularly passionate about. He has organized for many Iraqi Kurds to get medical treatment in Austria for complicated health problems that could not be treated in the Kurdistan Region. Having been appointed to be the KRG Representative in Spain, Mr Shadala began a number of initiatives to develop the relationships between the Kurdistan Region and Spain. Mr Shadala has developed a close working relationship with the Spanish government and has won their confidence, trust and friendship. He has arranged number of senior political delegations from the Kurdistan Region to Spain and a number of business delegations from Spain to Kurdistan. He has supported the arts and culture by organising an array of Kurdish art exhibitions and music events here in Spain. As a result of his hard work, dedication and service to improving the political, cultural, economic, and educational relations between Spain and the Kurdistan Region, Mr Shadala was awarded the Order of Civil Merit by Spain, an award which was established by King Alfonso XIII in 1926. Mr Shadala also sits on the Board of Directors of Halabja Football Club as he has assisted in improving football standards in the Kurdistan Region by arranging the opening of four Real Madrid Social Schools in Kelar, Erbil, Slemani, and Duhok, adding to that the signing of a Memorandum of Understanding between Halabja FC and Athletic Club. Mr Shadala is fluent in Kurdish, English, Spanish, German, and Farsi.